The Acaranga Sutra (Sanskrit: Ācārāṅgasūtra; Prakrit: Āyāraṁgasutta) is the first Aṅga of the Shvetamber Jain canon (Āgama). The text, which discusses the right conduct of Jain monks, has been translated by Hermann Jacobi (Jain Sutras, Part I; Sacred Books of the East, Vol. 22, Oxford 1884) and Acharya Mahapragya, who added a commentary (Acharanga Bhasyam, Ladnun 2001). 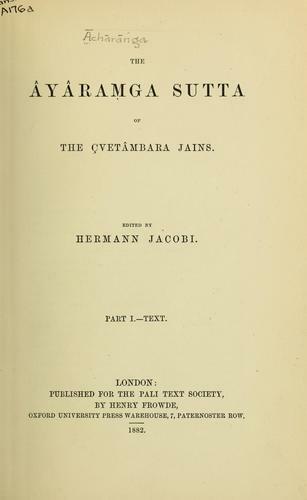 Since the Āgama literature is only accepted by the Shvetambar Jains, the Digambaras do not recognize the existing text and regard the original text as having been lost in its original form. The Digambara Mulachara text includes the Digambara tradition derived from Acaranga Sutra. The existing text of the Acaranga Sutra was recompiled and edited by Kshama Shraman Devardhigani, who headed the council held at Vallabhi 980 years after the death of Mahavira. Published by H. Frowde, London.